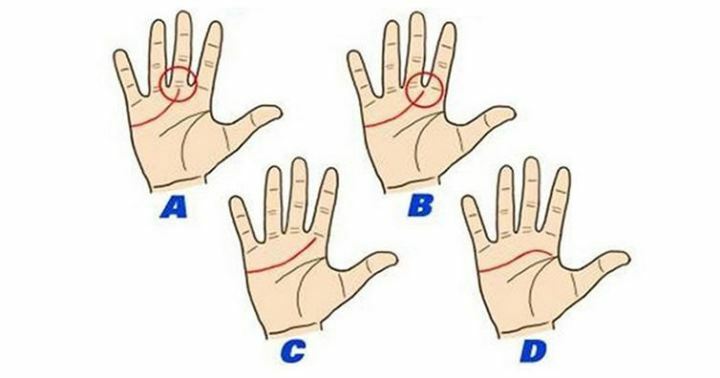 To figure out what your heart line says about the relationships you encounter in life and the love life you experience, you’ll have to compare your your heart line (outlined in red) on the palm of your right hand. If your heart line begins below your middle finger, you’re more of a leader. You’re ambitious, independent, intelligent and have the skill to make decisions. You’re less sensitive and more cold to others. If your heart line starts between the middle finger and index finger, you’re considerate and kind. You’re hesitant and cautious when other people are involved but people trust you. You use common sense in decisions. If it starts below the index finger, you’re like A. If it starts between the index finger and your thumb, you’re patient, caring, have good intentions and are soft-hearted.